I was of a generation raised by parents whose wartime experiences were still fresh, and who now craved better lives for their children. Entering an era of peace and prosperity, we were raised on Madison Avenue icons like Tony the Tiger and Elsie the Cow. Salisbury Steak TV Dinners were our go-to meal and Saturday matinees included a cartoon and a double feature. Jerry Lewis and Doris Day films were the best and all day long, AM radio played songs like, “Shake, Rattle and Roll” and “How Much is That Doggie in the Window?” We spent our days in school, carrying our metal lunch boxes and sharing silly secrets with friends. We’d swing from the monkey bars at recess, and, after school, beg our mothers for a dime so we could buy Hershey bars at the candy store. This was our reality. This was the life we knew. This was real. But someone killing the President WAS NOT REAL. The assassination of JFK was the shock felt around the world. I’ve written before about the kinship my Latino family felt for the Kennedy family and our first Catholic president, and how, like most everyone else in the country, we were devastated by his death. It was hard not to be. Frankly, I had never heard of Dallas but suddenly, I hated the place. On that fateful afternoon, 50 years ago, I was sitting in my third-grade class at P.S. 154 in Queens when the news came. Mrs. Warmbrand, who looked a lot like one of those serene moms you see on TV shows like Ozzie and Harriet or The Donna Reed Show, was teaching us about decimals. I was doing my best to concentrate, though my mind kept drifting, anticipating the start of the weekend, which was just hours away. I eyed the clock. Less than two hours to go. My friends, Elizabeth and Sonia, were sitting at their desks on either side of me. Elizabeth had brown hair and pale skin with a spray of freckles on her nose. I don’t know why, but to me she reminded me of Elsie the Cow in the Borden’s milk commercials. I once told her that, but she thought I was kidding. I wasn’t. I thought Sonia, who was Puerto Rican, was beautiful with her olive skin and large hazel eyes, a far cry from my own, beady little eyes. There was a knock at the classroom door, but before Mrs. Warmbrand could get up from her seat to see who was there, the door swung open and Miss Low, the school principal strode in with a sense of urgency about her. She was tall and always wore a navy blue pencil skirt, white blouse, and her graying hair wound tightly into a bun. Mrs. Warmbrand and Miss Low spoke in hushed tones. My classmates and I just stared blankly, straining to hear what was being said, but not being able to decipher a word, though from their expressions, we knew it wasn’t good. I felt Elizabeth take my hand and nervously squeeze it. Something was definitely amiss. President Kennedy? I couldn’t believe what Mrs. Warmbrand was saying, yet I knew it must be true, for Miss Low would never play such a practical joke on us. Not even if it was April Fool’s Day. But, why would anyone shoot the president? And, what about Caroline and John-John? Were they okay? As we returned to the lesson, Mrs. Warmbrand asked us to take out our Composition notebooks. While we did, she handed out a mimeograph sheet with a series of decimal problems on it. Just then, another teacher rushed in, without bothering to knock this time. Her face was stained with tears, as she spoke to Mrs. Warmbrand, who then turned to us and announced that the President was dead. The President of the United States of America. Dead. Not the kind of thing you ever expect to hear as a kid. Never. Mrs. Warmbrand instructed us to gather our things and go home. School was to let out early, and the buses would be outside waiting to take us home. In stunned silence we walked out to the curb with tears stinging our eyes. After that, it was all a blur. My mother was home with my baby sister. The TV console was already on. For the first time, television was providing non-stop news coverage and we were eating up every morsel of information it relayed. I sat next to my mother, who put her arm around me. Pretty soon, my brothers, who had also been dismissed from school, and my father, who was enrolled in a college in the city, also returned home. I was glad we were together. We spent that day and the rest of the weekend, watching, crying and not believing. We were reeling from the blow and feeling the collective anguish of the nation. My father, who would normally be scolding or beating any one of us kids, refrained. It was as if the shock was too much for us all and a truce had been declared in our household. Until that day, I’d never seen so much agony. The whole world shut down and parked itself in front of the console and, like us, watched and watched, craving every bit of information, clamoring to see a glimpse of the First Lady, to know how she was faring, and praying for the children, Caroline and John-John. We wondered whether they’d ever be the same again and whether we’d be, for that matter. Even Walter Cronkite couldn’t hold it together. And, when I saw Jack Ruby shoot and kill Lee Harvey Oswald in front of the country, on national television, I naively cheered, thinking him a hero, and not realizing what effect it would have on the investigation. This happened so many years ago, but as the 50th anniversary of the assassination is upon us this week, I am reliving it all over again. Many say, that’s how you know a Baby Boomer. If they can remember where they were when shots were fired in Dallas. I suppose, if there’s ever a good side to events like these, it’s the power to bring a people together. Young and old, we mourned. We were one in our bereavement and in our loss of a place in time that we once called, Camelot. Recently, as programming about that day has been airing on TV, I decided to ask my son his thoughts on the JFK assassination. He responded that to him, it’s just another date in our history and that other than that, it means nothing to him. Wow. It’s hard for me to understand that view, but I suppose someday, someone may be saying the same about September 11th. Who knows. So, what are your thoughts? And, if you were around then, where were you when you got the news? Monica, I wasn’t around then, but I’ve shared in the grief many times over. 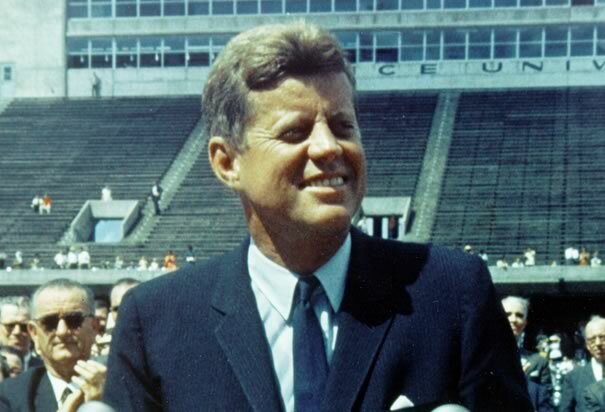 I can’t tell you how I’ve read, watched and re-read many articles and books about the death of JFK. I’ve seen so many stills of a little boy’s salute to his father and a little girl staring forlornly, it breaks my heart every time I see them. You’ve captured your memory of it so beautifully for you were a child yourself, the impact huge. When JFK Jr. died, I was devastated. He was so young and had his whole life ahead of him, in him I saw his father’s pride and perhaps the future his father never had. I have for so long been fascinated by this beautiful family, torn apart by tragedy, a charismatic President, who did so much, a nation’s hope, gone, just like that. Thanks, MM. JFK’s presidency had a large presence in my life, even as a kid. I can’t explain it, but he and his family were so important to us. It was awful when he died. just awful. I wasn’t born yet, but I have goose bumps from your post. I’ve been watching all the TV shows about it and reading about it, and of course have heard about it all my life, but I have to tell you, you’re piece made me feel what it was like to be a kid on that day. Thanks for sharing it with us, Monica. Becky, I’m deeply touched by your sentiment. This whole week has been one of mourning for me, feeling the pain all over again. Wishing things had turned out differently. Wishing my innocence hadn’t ended so abruptly. Praying for Caroline and understanding why she had to leave for Japan before this anniversary. Feeling the ache in my heart when I see the photos of Jackie in her pink suit, the children at the funeral, and me being 8 years old all over again, watching it all unfold on TV. It’s a feeling that’ll stay with me always. I am so grateful for people like you, who don’t remember, who weren’t there, yet are honoring his memory just the same. Why him? Such a good leader. A symbol for a bright and beautiful tomorrow. For hope and progress. Why him? Such a moving and exquisitely written post, Monica. I recall being a freshman in high school. It was lunch time and the news was given to us over the speaker system. The world shifted on its axis and has never been the same. Thank you, Jayne. You’re not the first one I’ve spoken to that heard it over their school’s PA. Seems like an impersonal way to learn such tragic news. And you’re definitely correct. The world has never been the same. We’ll never know how different it could have been had he lived. Funny how these marker years bring it all back home even more profoundly. I don’t know anyone who doesn’t remember where he/she was on that day . . . or wasn’t glued to the TV in the days that followed. Lou Reed’s haunting song, “The Day John Kennedy Died,” has been running through my head this week. I posted a link on Facebook. I know what you mean. I’ve been devouring nearly every bit of information on TV, in books, on the web, about JFK and November 22nd. It’s a date in history that I’ve been silently honoring every year since. The beginning of the upheaval of the sixties. My parents weren’t Kennedy supporters, but it was exciting having the first Catholic president. I remember being in school. What we were studying, I don’t know. I remember our teacher going outside briefly, then returning with the news. We all were shocked and like you, were sent home early to sit glued to the TV. Later, after I married and moved to the Dallas area, my then-husband and I toured all those historic places — I especially recall the Grassy Knoll, the eerie silence and the ghosts of Camelot. Of course, it’s all built up now and I’m certain Texans would like to put the entire chapter to rest, but it’s part of their history — and ours as a nation. I imagine my son would feel pretty much like yours in saying it’s just another day on the calendar, though. Odd, how certain things define a generation. Those were momentous times. Plus, for us it was a time of innocence. And then it all unraveled. I will never forget. A beautiful, touching post. You’ve captured your memories and sentiments surrounding this day 50 years ago so very well. I turn 50 tomorrow so my birthdays are always tinged with this sad anniversary. My sister just turned 50, too. She was about six weeks old at the time of JFK’s death. So like you, she remembers nothing, and her birthday is forever aligned with his passing. Sigh. Thanks for your touching post. I was only 5 at the time, so I don’t remember it, but it affects me much more greatly now that I am an adult and can fully grasp the significance and tragedy of it all. Thanks, Susan, for your thoughts. Yes you were young when it happened, but I’m happy to hear how you’ve learned to appreciate its impact on our history. Hope you’re watching some of the news coverage and documentaries. PBS has been airing quite a few. Thank you Jueseppi, for reblogging. Much appreciated! My pleasure, a very good post Ms. Monica. I don’t remember what coverage we had over here at the time, it was of course in the days before a 24 hour news channel, all we had at the time were a couple of TV channels and they were not 24 hour. It is I think fair to say that the sad event was world changing, but I don’t think the majority of the world perhaps appreciated that at the time. Time dulls peoples memories, your son’s responise would be the same as youngsters in the UK being asked about the death of Winston Churchill. He had a state funeral and that day was a sombre one for the majority of the UK, but now it has passed into history, and the number who remember the event are becoming less by the day. Interesting you bring up Winston Churchill. I imagine his passing was a big deal over there. Here, I don’t recall it at all. But the thing about JFK that Churchill I think didn’t have going for him, was his youth. He was so young, as was his family, which made his death all the more tragic and heart-wrenching. Yes I would agree Monica is young age and that of his family made it even more tragic. I was only an infant when Kennedy was killed. I don’t remember a thing. It reminds me of 9/11, however–how when tragedy on a massive scale strikes, you always remembers where and when you were when it happened. I keep thinking, however, tangentially, that I can’t believe you are 8 or so years older than I. Gosh, you don’t look it, Monica! I was “too young to remember” yet I have always maintained that I do. Not the specifics of the shootings, but the funeral and what the assassination did to the household. The TV was always on, and that was unusual. There was my sisters 1st birthday (the 20th), Thanksgiving, and my little sisters birth (Dec. 3) and underlining it all the President was dead. I remember the day my mother brought my little sister home from the hospital. Why wouldn’t I remember this? Lisa, considering how young you were, you sure remember a lot. It’s all about what made an impression on you. Clearly the birth of your little sister made a big impression and probably had a great impact on your life! Living only 100 miles east of Dallas, I remember it vividly. In changing class to the last period of the day, word traveled fast in the breezeways (all classes opened to the outside so we didn’t have hallways.) Mrs. Cruise confirmed what we had heard. I don’t remember the lesson like you do, but it was science. Since everything was black and white, it was surprising to see the lovely pink Mrs. Kennedy had been wearing in the pages of Life Magazine. That horrible stain on her skirt confirmed the unthinkable and unbelievable. I heard a story explaining why Mrs. Kennedy never changed clothes that day returning to Washington. “Let them see what they have done,” was a quote I heard. I felt horrible that it happened in my state. It took a long time for the name Dallas to recover from the shame. Everything about Dallas was a reminder – Love Field, the Texas Theatre, the Texas Schoolbook Depository, Texas Parkland Hospital and grassy knoll. I didn’t know Dallas that well when we used to visit, but all of a sudden I learned the names of places I hadn’t heard of. My mother and my husband’s grandmother kept newspapers and magazines of that horrible and historic time. I wasn’t born yet. But I am eating up the coverage, finding it fascinating! My husband is also enthralled! I’m so glad to hear that Jodi. For those of us who remember, this was a huge moment in our lives. The world changed that day, as did the way we consume our news. Overnight, newspapers took a backseat to TV, which, for the first time, was providing round the clock coverage. Funny thing, though, TV was depending a lot on the newspapers for their info. Who knows what like would’ve been like had he lived. I was also in school at the time, also had a similar experience. I walked home after being let out early. Found my mother in front of the TV crying. She sent me to my room, wanting to mourn without being bothered by either me or my little brother. My father, who was a Boeing engineer came home early that day, I think it was one of the few times in his career he ever missed a day of work other than when he had his heart attacks many years later. My father was not a big fan of Kennedy. My mother had a serious crush on him as a man and a President. They fought about it right up to election night and then she gloated. Even my father though was stunned and angry by the Presidents death, he saw what it would do to the nation. Thank you, Val, for sharing your own memories. I’m always impressed by just how much we do remember. But no matter where you stood on the aisle, no one wanted to see our president killed. Nobody could be happy or satisfied that day.